Calling all faerie folk, all ye queer and gentle creatures, inverts, perverts, sodomites, Uranian lovers, Sapphists, finger artists, nancy boys, camp queens, dolly fruits, closet cases, switch hitters, stone butches, longtime companions, confirmed bachelors, strange sisters and loving comrades! 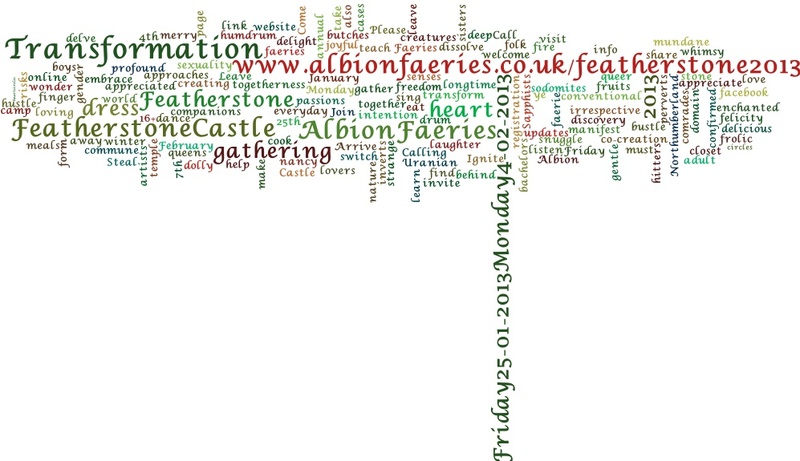 We invite you all to the 7th annual winter gathering of the Albion Faeries at Featherstone Castle in Northumberland. Steal away from the humdrum world, from the hustle and bustle of the everyday. Leave behind the mundane and the conventional. Join with us in creating an enchanted domain of freedom and discovery. We will share and listen at heart circles, cook and eat delicious meals together, dress up, dress down, frolic in the love temple, snuggle by the fire, drum, sing, dance and make merry. We will gather from Friday, the 25th of January until Monday, the 4th of February, 2013. Arrive when you can, leave when you must. This gathering is a co-creation of all who are there. Come with intention and help us manifest felicity, wonder, and joyful togetherness. 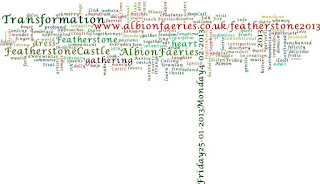 Please visit our website at www.albionfaeries.co.uk/featherstone2013 where you’ll find more info about the gathering and a link to our online registration form. We also have a facebook page at www.facebook.com/EurofaeriesFeatherstone2013 which will have updates as the gathering approaches. We welcome all adult faeries (16+), irrespective of gender or sexuality.